I have been giving thought lately to William of Occam. Hence my post below. In the course of my researches I downloaded his image. That is him on the extreme left. After posting on Occam below, I found my thoughts drifting to the association between Occam and razors. The association led me in due course to thoughts of Jack the Ripper - another famous razor man. 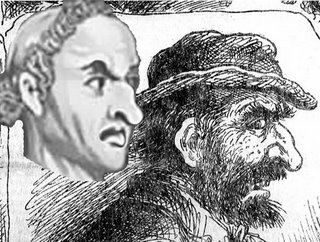 On impluse, I downloaded a police artist's sketch of Jack the Ripper and juxtaposed the sketch with Occam's profile. Spooky eh! I know that these two are alleged to have lived in different eras. But the striking resemblance, and the razor connection are enough for me. Jack the Ripper and William of Occam are one and the same person. I shall name him Occam the Ripper. Stand by for another runaway conspiracy theory.